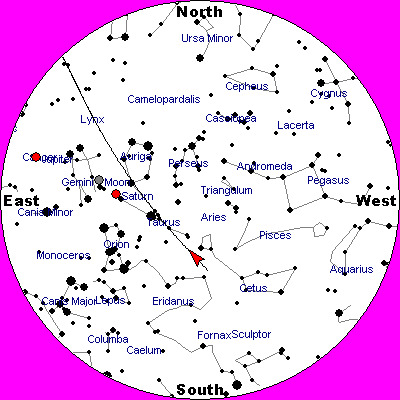 This sky chart shows the constellation Cetus, the whale. This time of year, a tiny constellation can be found during the late evening hours, high in the south-southeast part of the sky: Delphinus the dolphin. The star pattern is composed of only faint stars, yet the stars are so close to each other that they can easily be seen on clear, dark nights. A variety of different descriptions have been used in various astronomy guidebooks for Delphinus; everything from charming to just plain cute. It forms a distinctive diamond-with-a-tail pattern that gives this group a prominence greater than you might otherwise expect from so faint a constellation. Some reference books refer to the diamond as "Job's Coffin," though the origin of this name is unknown. Two stars in Delphinus have rather odd names: Sualocin and Rotanev They first appeared in the Palermo Star Catalogue in 1814, but nobody seemed to have a clue as to their origin. The English Astronomer Thomas Webb finally solved the mystery by reversing their letters, revealing the name of Nicolaus Venator, the Latinized form of Niccolo Cacciatore, the valued assistant and eventual successor of Palermo Observatory's Director Giuseppe Piazzi. But to this day no one knows whether it was Piazzi or Cacciatore himself who ultimately christened these two stars. According to legend, Arion, a Greek musician, was sailing aboard a ship to Corinth, carrying a substantial cache of money and jewels. Unfortunately, the ship's crew planned to throw Arion overboard and abscond with his treasure. Dolphins (the family Delphinidae) are sometimes thought of as the smallest whales. Although "dolphin" is also the name of a large tropical sport fish, whales – including dolphins – are not fish, but mammals. When Delphinus happily swims high in our south-southwest sky at around midnight local daylight time, the sky's "real" whale will have fully emerged into view, sprawling above the southeast horizon: Cetus. Known by the ancient Greeks as the whale that was about to attack Andromeda when Perseus destroyed it, Cetus was later thought to represent the whale that consumed Jonah in the Bible. However, if one were to look at some of the allegorical star atlases of the past few hundred years, the portrayals are hardly what we know whales to be. In fact, not a few astronomy guides refer to Cetus as a sea monster, even though, ironically, the scientific name for the whale order is Cetacea. Some star atlases in fact, depicted Cetus looking more like Godzilla with a fish tail. Cetus consists chiefly of faint stars, but it occupies a relatively large part of the sky. Its head is a group of stars not far from Taurus and Aries, and its body and tail lie toward Aquarius. Within Cetus is the star known as Mira, the first-ever variable star to be discovered. In August 1596, the German astronomer David Fabricius saw a third-magnitude star in Cetus, the whale. As the intruder faded in the following weeks, it was natural to suppose that it was a nova, or star explosion. Then, a Dutch observer, Johann Fokkens Holwarda, watched this ruddy star brighten and grow dim again in 1638. While a nova would not be expected to reappear, this one was flashing on and off again like a very leisurely lighthouse. As astronomers became aware of the unusual fluctuations they honored the star with the name it now bears: Mira, the "Wonderful Star." Mira grows brighter, then fainter, then brighter again in cycles of approximately 332 days; it rises to its greatest splendor twice as fast as it fades to obscurity again. It is a binary star pair, with one star being a red giant and the other a white dwarf. Mira's dramatic changes in brightness are due to the red star swelling in size at regular intervals. At its faintest, Mira is about fifteen times dimmer than the faintest star you can see without a telescope. At maximum, it usually reaches third magnitude, or about 250 times brighter. Sometimes — but rarely — it attains second magnitude and once, in 1779 it almost equaled first magnitude Aldebaran in brightness. On astronomers' magnitude scale, greater numbers represent fainter stars. Mira has, in fact, just passed its peak brightness, so it might be worth checking this week to see exactly how bright it appears.